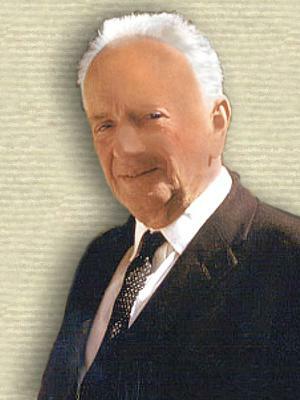 Ukrainian-American geneticist and evolutionist whose work had a major influence on 20th-century thought and research on genetics and evolutionary theory. He made the first significant synthesis of Charles Darwin's theory of evolution with Gregor Mendel's theory of genetics in his book Genetics and the Origin of Species (1937). At the beginning of its existence as a science, biology was forced to take cognizance of the seemingly boundless variety of living things, for no exact study of life phenomena was possible until the apparent chaos of the distinct kinds of organisms had been reduced to a rational system. Systematics and morphology, two predominantly descriptive and observational disciplines, took precedence among biological sciences during the eighteenth and nineteenth centuries. More recently physiology has come to the foreground, accompanied by the introduction of quantitative methods and by a shift from the observationalism of the past to a predominance of experimentation. In Genetics and the Origin of Species (1937, 1982), 6. Does the evolutionary doctrine clash with religious faith? It does not. It is a blunder to mistake the Holy Scriptures for elementary textbooks of astronomy, geology, biology, and anthropology. Only if symbols are construed to mean what they are not intended to mean can there arise imaginary, insoluble conflicts. ... the blunder leads to blasphemy: the Creator is accused of systematic deceitfulness. Evolutionary plasticity can be purchased only at the ruthlessly dear price of continuously sacrificing some individuals to death from unfavourable mutations. Bemoaning this imperfection of nature has, however, no place in a scientific treatment of this subject. Genetics and the Origin of Species (1937), 127. Genetics is the first biological science which got in the position in which physics has been in for many years. One can justifiably speak about such a thing as theoretical mathematical genetics, and experimental genetics, just as in physics. There are some mathematical geniuses who work out what to an ordinary person seems a fantastic kind of theory. This fantastic kind of theory nevertheless leads to experimentally verifiable prediction, which an experimental physicist then has to test the validity of. Since the times of Wright, Haldane, and Fisher, evolutionary genetics has been in a similar position. Oral history memoir. Columbia University, Oral History Research Office, New York, 1962. Quoted in William B. Provine, Sewall Wright and Evolutionary Biology (1989), 277. Judged superficially, a progressive saturation of the germ plasm of a species with mutant genes a majority of which are deleterious in their effects is a destructive process, a sort of deterioration of the genotype which threatens the very existence of the species and can finally lead only to its extinction. The eugenical Jeremiahs keep constantly before our eyes the nightmare of human populations accumulating recessive genes that produce pathological effects when homozygous. These prophets of doom seem to be unaware of the fact that wild species in the state of nature fare in this respect no better than man does with all the artificality of his surroundings, and yet life has not come to an end on this planet. The eschatological cries proclaiming the failure of natural selection to operate in human populations have more to do with political beliefs than with scientific findings. Genetics and Origin of Species (1937), 126. 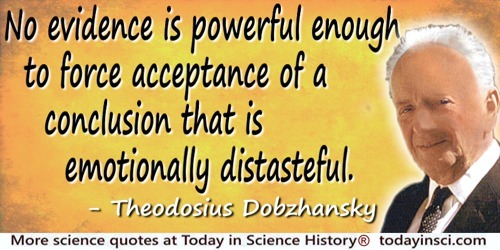 No evidence is powerful enough to force acceptance of a conclusion that is emotionally distasteful. 'Review of Evolution, Creation and Science by F. L. Marsh', American Naturalist, 79, 1945, 75. Title of article, 'Nothing in Biology makes Sense except in the Light of Evolution', The American Biology Teacher (Mar 1973), 125. Used earlier, stated in a different word order in 'Biology, Molecular and Organismic', American Zoologist, 1964, 4, 449. Nothing makes sense in biology except in the light of evolution. 'Biology, Molecular and Organismic', American Zoologist, 1964, 4, 449. Later, worded slightly differently as an article title, 'Nothing in Biology makes Sense except in the Light of Evolution', The American Biology Teacher (Mar 1973), 125. The frequent allegation that the selective processes in the human species are no longer 'natural' is due to persistence of the obsolete nineteenth-century concept of 'natural' selection. The error of this view is made clear when we ask its proponents such questions as, why should the 'surviving fittest' be able to withstand cold and inclement weather without the benefit of fire and clothing? Is it not ludicrous to expect selection to make us good at defending ourselves against wild beasts when wild beasts are getting to be so rare that it is a privilege to see one outside of a zoo? Is it necessary to eliminate everyone who has poor teeth when our dentists stand ready to provide us with artificial ones? Is it a great virtue to be able to endure pain when anaesthetics are available? Theodosius Dobzhansky and Gordon Allen, 'Does Natural Selection Continue to Operate in Modern Mankind? ', American Anthropologist, 1956, 58, 595. The outlook seems grim. Natural selection under civilized conditions may lead mankind to evolve towards a state of genetic overspecialization for living in gadget-ridden environments. It is certainly up to man to decide whether this direction of his evolution is or is not desirable. If it is not, man has, or soon will have, the knowledge requisite to redirect the evolution of his species pretty much as he sees fit. Perhaps we should not be too dogmatic about this choice of direction. We may be awfully soft compared to paleolithic men when it comes to struggling, unaided by gadgets, with climatic difficulties and wild beasts. Most of us feel most of the time that this is not a very great loss. If our remote descendants grow to be even more effete than we are, they may conceivably be compensated by acquiring genotypes conducive to kindlier dispositions and greater intellectual capacities than those prevalent in mankind today. Theodosius Dobzhansky and Gordon Allen, 'Does Natural Selection Continue to Operate in Modern Mankind? ', American Anthropologist, 1956, 58 599. There is no doubt that human survival will continue to depend more and more on human intellect and technology. It is idle to argue whether this is good or bad. The point of no return was passed long ago, before anyone knew it was happening. 25 Jan - short biography, births, deaths and events on date of Dobzhansky's birth.